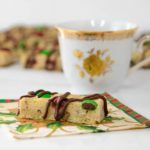 A recipe for chocolate chip shortbread bars. The bars are buttery and filled with either chocolate chips or chocolate coated candy. They are a great treat for any time of the day. Whisk together flour and salt. Add to the creamed mixture and mix only until blended. Stir in pecans and 1 1/4 cups chocolate chips. Press dough evenly into a 17- X 13- X 1-inch sheet pan. Sprinkle top with remaining 1/2 cup chips. Slightly press chips into dough. Bake 20 minutes or until light golden brown. Be careful not to over-bake. Cool shortbread completely in the pan. Once cooled, cut into bars approximately 1- X 3-inches in size. Drizzle with chocolate glaze if desired. Sift the confectioners sugar and cocoa and place in a small bowl. Add the salt, vanilla, and milk. Stir until smooth. Place glaze in a plastic zip-top bag and close bag removing all air. Snip a tiny piece off one corner of the bag. Squeeze the bag to drizzle the glaze on the shortbread. *Time does not include cooling shortbread.